CS. You highly deserve the 2013 world title after such a mastered performance throughout the rounds of the KO System, knocking out one by one French Alexandre Claris (1/8f. 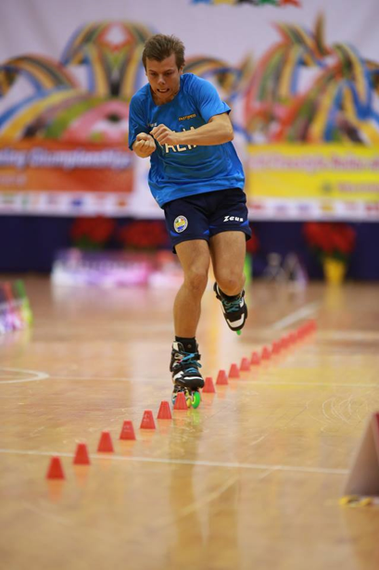 ), current World No.1 and Italian team mate Simone Nai Oleari (1/4f. ), local Wu Dong Yang (1/2f.) 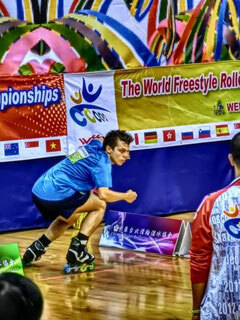 and finally Chinese Guo Fang, a triple world champion whom only French Yohan Fort, former World No.1 and double World Champion, had managed to defeat at a world championship until you. What was your toughest opponent in that competition? DP. Looking at the world ranking and at the results of the last competitions, I would definitely say Simone Nai Oleari. But actually, given that everyone was so fast and so determined to win, even a little mistake could have compromised the competition. CS. Are you satisfied with your WFSC performance? And what do you want to improve next time? DP. Once I managed to find the right setting for the floor -which was slippery- I became more confident. Surely I'm very happy with my performance, because I was finally able to show and express my real potential. For the next competitions, my goal is to avoid stupid mistakes, especially during the qualifications. CS. The whole Italian team did great rankings in speed slalom, what is your secret? DP. There is no secret, we simply try to push each other to our maximum potential, so that everyone can count on his teammates, during the trainings but also at competition. We also try not to underestimate even the smallest competition and put everything we have in our performances. DP. Being able to win against such strong competitors makes you appreciate the result even more. It was a big surprise for me, even though I've been training really hard for a long time. CS. What does it feel like to be on top of the world? DP. I can say that the satisfaction is really big but I don't think that winning has changed me or the way I behave, I'll keep doing what I've always done, that is to say pushing myself and trying to do my best. I will keep training and try to improve my performances.